When the world is being overrun by bad guys, the first port of call is usually the superhero. Coming in all shapes and sizes, with multiple skills, special powers and more in their armoury, chances are that without them the world would be a hugely different place. But the latest 3D brawler to hit our consoles does away with the true superhero, instead relying on a bunch of misfits to take control of matters. Can the Deadbeat Heroes lay claim to the crown of true hero and save London from being overrun by bad guys? Or even with their very best intentions laid out in front of them, do they struggle to appeal as much as Bats, Supes and Spidey? 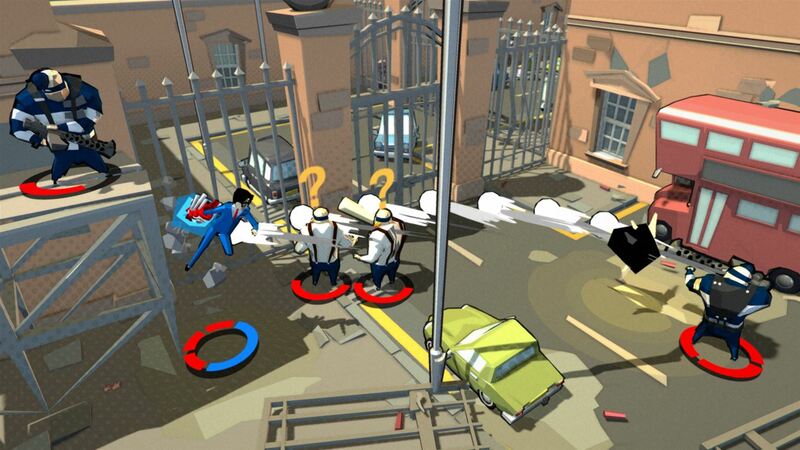 The streets of a destructible London town play host to the action found in Deadbeat Heroes and as you make your way through the adventure, will find a whole host of goons who need the smackdown dished out. A swift kick and punch will usually be enough to despatch any enemy, with magical orbs being left where the deceased have fallen. As you progress, you will find that your opponents come increasingly well geared up; pistol shooters are a regular occurrence, whilst shotgun and machine gun wielding bad guys are pretty common place. Certain types of enemy are more intelligent than others too, forcing you back should you try and tackle them head on, or attacking with plenty of gusto. A swift jump over their heads, followed by a dig in the back is usually enough to sort them out, or should you have collected enough orbs, you will be able to utilise a special attack for a much swifter dismissal. It is here with the tactical jumping nature where the open attacks of Deadbeat Heroes come into play, with wall runs and obstacle climbing seeing you given the chance to mix your attacks up – creating much needed combos in the process. It never fails to amuse me to see my rather puny heroes delivering a swift punch, before scaling a wall and ending a goon’s life by piling into him from up high. 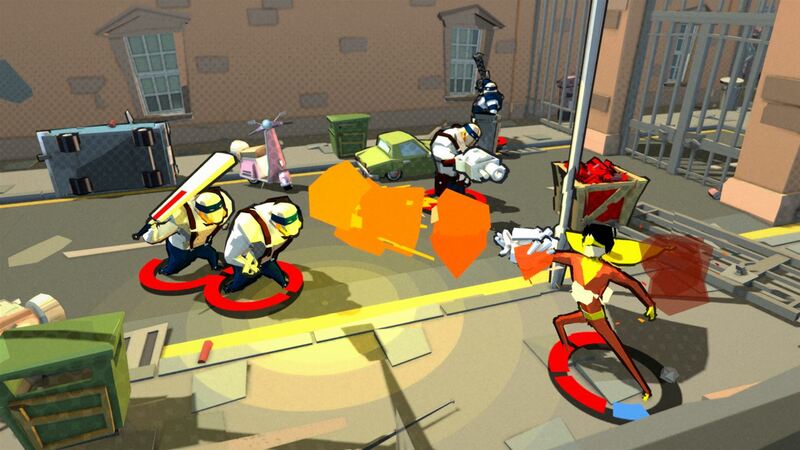 The entirety of Deadbeat Heroes will see you making your way through numerous levels, beating down those bad guys and dodging bullets, lasers and more. You will however get the chance to ‘acquire’ some rather special super powers. You see, whilst the basic mechanics involve smashing fist into face time and time again, it is when you come up against the end of stage guardians where Deadbeat Heroes really starts to get interesting. As a standard Joe, you are obviously hugely at odds with the powered bosses, and so you’ll need to use every trick in the book to beat them back. You do this by utilising your magical super gauntlet, giving you the chance to borrow and use the power of any previously beaten boss style character. With your gauntlet attached to your arm, you’ll be able to gather up numerous abilities like a freeze power, invisibility, a huge explosive detonation or more. As you would expect, these dish out some serious damage opportunities and allow you to uncover different tactical strategies away from the usual punching, flinging, smashing and ground-pounding. You’ll need to use these super powers too as your progression through London town doesn’t only come about by beating down bad guys. Each stage may be a fairly swift affair, taking just a few minutes from start to end, but during that time you’ll need to ensure that combos and powers are utilised wherever possible. This isn’t just for your enjoyment though, as any fight will need to be completed with a decent ranking, with larger points delivered with an increase in your style. With the usual S to U ratings that us gamers understand, thrust your way dependant on your skills, it is only when you can gather up, at least, enough C+ ratings will you see Deadbeat Heroes’ future levels, and future bosses, unlocked. And this unfortunately is where my enjoyment with Deadbeat Heroes has seriously diminished. You see, there is no way of knowing how many points are needed for you to grab this coveted C score and even though level repetition is both encouraged and entertained, without knowing exactly how far you are from progressing there is little enthusiasm to keep you going back for more. As it stands, I’m sat with my time in Deadbeat Heroes at a standstill, as I can’t skillfully make my way past a certain set of stages. Blame my skills if you must, but a D rating is more than obtainable – and that is something I’ve picked up on multiple occasions. But that C? It could be absolutely way off. Or it could be that I only need to grab an extra 100 points from a single hit to a bad guy’s face. But I don’t know which it is, and after multiple attempts culminating in failure, and not knowing where or how I should improve, I’m left in a state of limbo. Trial, error and much repetition is therefore required in order to see you magically make the grade and it would therefore have been absolutely superb if the developers had implemented some kind of progress bar. At least then anyone left struggling would know where to focus their efforts instead of being left to just battle through with little clue. 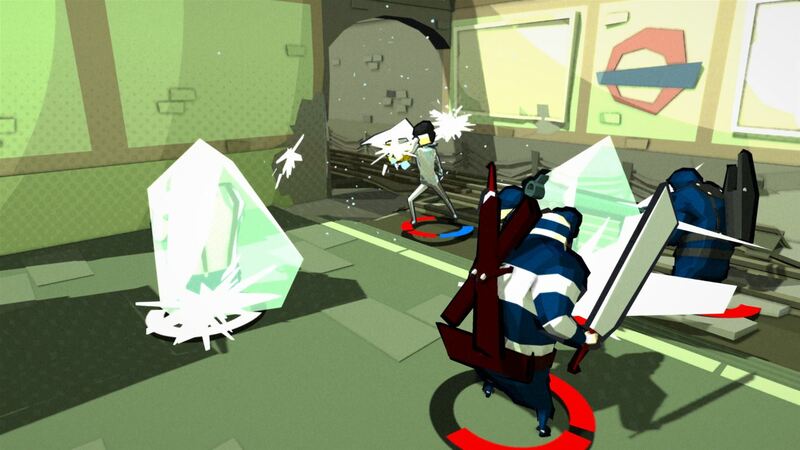 Deadbeat Heroes can also be played with a local co-op friend alongside you, and even though it works well as a solo experience, it really does come alive in local co-op. Now this is a great way of sharing the enjoyment and the basic mechanics work well when two players get in on the action, but there is a little bit of stutter as the camera attempts to focus in on both protagonists, and their attacks, at the same time, flicking between them as it does. It’s so minute an issue that it’s barely worth worrying about, but I feel that it needs pointing out. 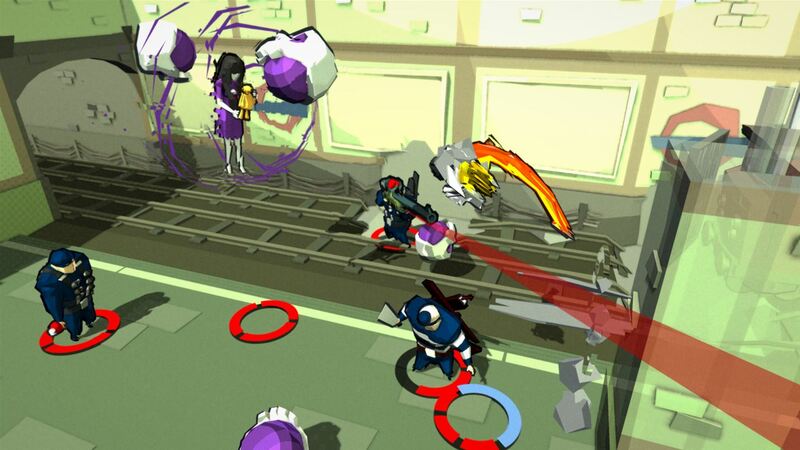 Sharing orbs, powers and health pickups is a delight too and Deadbeat Heroes really does shine in the multiplayer sense. The multiplayer opportunities also give the chance for further ratings targets to be hit and it’s good fun to try and beat the score of your mate, as you battle it out alongside them. But there’s also an issue with all that and it again inflicts the progression found in Deadbeat Heroes. Something which is hugely infuriating once more. You see, no matter what score you gain in multiplayer, it doesn’t seem to translate to any form of progression. If we take the levels in which I’m currently sitting with three D ratings in my solo career as examples, then surely by completing those in multiplayer, everything would be fine and dandy? Well, taking in the multiplayer with a friend has seen those D’s smashed – by both players might I add. Does that therefore mean further stages are unlocked? Does it hell. In fact, whatever you score in co-op seems to matter little to the overall outlook on things. Whether this is a bug or a genuine development decision, I’m unsure. But it seems absolutely crazy to see this problem included in a game that would otherwise be well worth your time. Add in the fact that should your team of wannabe heroes be completely wiped out, you’ll see any progress made within each small set of stages removed along with them. Again, this is utterly frustrating as you may have found yourself just about struggling to hit the required unlock status on two out of three levels, to then come a complete cropper on the last, and see yourself and your heroes thrown back to the start of that entire section again. When a player has been lucky to scrape together the skills required for one stage, to only see those efforts removed because of a failure elsewhere, then something is a little wrong. At least in my eyes. Anyways, visually and you may find yourself looking at Deadbeat Heroes and wondering what the hell has happened with the latest gen. But whilst the visual style definitely comes across with a bit of a marmite look, I’m a huge fan. Details are given where needed, but the overall comic book capers style oozes quality and screams ‘60s Batman. The whole caped crusader theme goes a bit further too with thwacks and smashes emblazoned on screen when your special super-powerful strikes hit their target; whether that be an enemy or just as you go about destroying the world around you. That in itself is worth playing Deadbeat Heroes for. The audio is also good with the humorous voice overs and conversations being well scripted, brilliantly acted affairs. The whole thing never comes across too seriously, and that in turn works well for what the game is trying to portray. No awards are going to be won, but the backing soundtrack that accompanies your adventure is equally as decent and sees Deadbeat Heroes come across as a fun button mashing romp. At least until those progression issues hit. 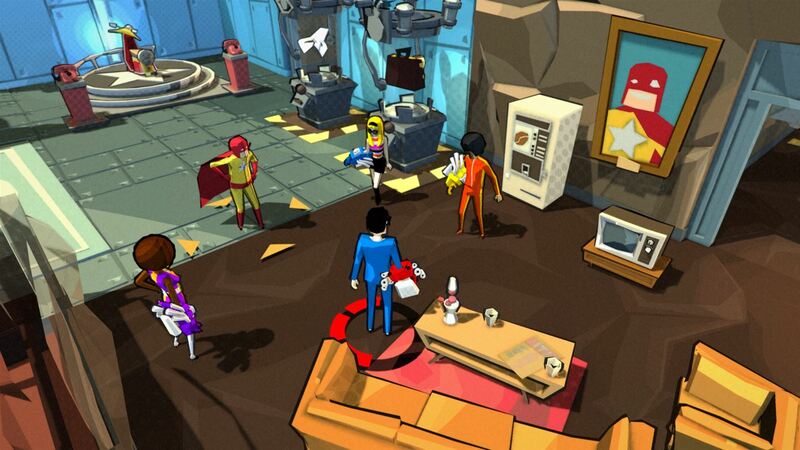 If you’re bored of the usual superheroes and are just looking for something a bit different, a bit funny and a bit, um, button mashing, then Deadbeat Heroes delivers. It’s far from perfect, and the issues with gameplay advancement are hugely annoying, but it’s just about worth a play if you fancy a bit of mindless comic violence.